Libby, the ereading app from OverDrive, is a nice, easy way to find and read library books. In some places here in the States—I don’t know about outside the U.S.—you can even use Libby to sign up for an instant library card. I myself appreciated OverDrive’s belated addition of all-text bolding after heartfelt pleas appeared on TeleRead and Facebook. The bold option is a must for people like me who suffer contrast-sensitivity issues. My thanks! But Libby still cannot (1) run officially on the popular and affordable Amazon Fire tablets, (2) export notes through email or otherwise or (3) let you press a volume control button on your phone to move on to the next page or return to the previous one. Libby is around two years old. It’s high time that OverDrive—“the leading digital reading platform for libraries and schools worldwide”—filled in the gaps. Amazon’s stubborness is almost surely the biggest barrier in the case of the Fire. But ideally OverDrive will try harder to turn Amazon around. If that won’t work, then OverDrive should allow direct downloads of Libby from overdrive.com—for Fire users—even though less tech-savvy people may be challenged. The optimal solution? No. But at least OverDrive can control the copies distributed and enjoy more leverage with Amazon. Whether you’re a librarian or a patron, please speak up to your local librarians and tell them to contact both OverDrive and Amazon. I hope that the American Library Association will care as well. Your yourself can write jeff@amazon.com. The changes suggested here would be good for OverDrive itself, not just libraries, mass literacy and library-inspired book sales. Just the Fire omission alone could be costing Libby many thousands of users. Simply as a booster of ebooks for libraries, I’m glad to see OverDrive’s digital book business growing, but that’s no excuse for the smugness—at least about the non-Amazon issues—when clearly the resources exist. Japan’s Rakuten conglomerate bought OverDrive three years ago for a whopping $410 million in cash (the official name is Rakuten OverDrive), so the wherewithal is there. For months, however, to no avail so far, I’ve been asking OverDrive to fix the omissions listed below. Getting Libby on the Fire will require approval from Amazon. The other matters won’t. While users could buy nonbrand cheapie Android tablets, so many of them come with viruses. That is one reason why I’m keen on Fires as platforms for cash-strapped users. But it isn’t the only one. The hardware is good for the price and the numbers make sense. The seven-inch screen of the $50 Fire 7 might not be right for the more demanding users in rural America and elsewhere. But the eight-inch $80 Fire HD 8 has both a solid four-star rating among customers and at least an adequate screen of 1280 x 800. And you can pick up used Fire HD 8s or new ones on sale for just $50 or so via Amazon or eBay, well under the usual $80. At $150 normally and $100 when on sale, the ten-inch Fire HD 10 is another possibility—the top photo shows mine in a kidproof case in the landscape orientation. The LCD display is 1920 x 1200 or 224 pixels per inch, old E Ink territory. And here’s what a book looks like in the portrait mode with all-bold. Not bad, eh? Unsurprisingly, then, Fires are among the most popular budget-priced tablets, maybe even the most popular. So why must their owners—at least the nontechie ones—go Libbyless? I’m not out to help or hurt Amazon or OverDrive here; I just want to see library patrons better served. Yes, there are workarounds for Fire users, such as the older OverDrive application, already in the Amazon store. But that defeats the whole point of Libby, which is much easier to use and in general a better app than other OverDrive offerings. Libby lets you find the right book, then display and read it without quite all the hassles you might suffer otherwise. And it is nicer to use than OverDrive Read, a browser-centered app, which, like Libby, won’t let you export notes and highlights. A third workaround is to install the Google Play Store on your Fire, then download the well-reviewed Android version of Libby from the store. We’ve told you how to get the store going (here and here). This, however, is not a solution for nontechies. A fourth workaround would be to use Good Ereader’s app store to catch up with an unofficial copy of Libby. I have not researched the legalities to see if schools and libraries would be opening themselves up to legal liabilities if they bypassed OverDrive this way. What’s more, installing Libby this way will still require a certain amount of tech savvy. When I use Fires, E Ink Kindles or related apps, I can email notes and highlighted text to myself even if there is a percentage limit on highlights, based on the total length of the book. OverDrive’s new Sora app for schools likewise allows export capability Why not Libby? Danger—marketers at work? Is OverDrive trying to help justify Sora’s existence by handicapping Libby this way? Or are OverDrive’s programmers just too overworked—despite the company’s wealth—to add this essential feature? For that matter, the company needs to restore export capabilities to the older OverDrive app if it had them earlier. How can anybody be a serious digital reader and not build a collection of notes and highlights? Deprival of the ability to make notes accessible via many apps and devices, not just OverDrive-capable ones, shows disrespect for library users. Can’t OverDrive catch up with Amazon? 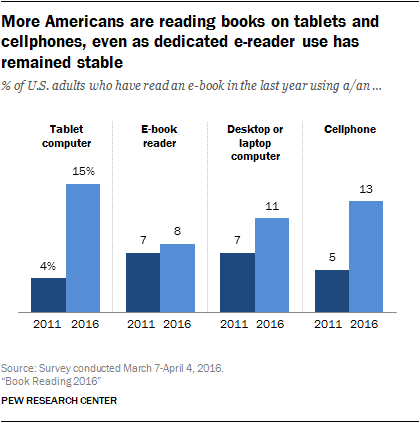 As you can see from the chart below from Pew Research, cell phones are a major way to read ebooks. Why, then, can’t the Libby app be kinder to cellphone users and let them “turn” pages by pressing the “increase” or “decrease” volume buttons? Furthermore, the app should allow them to swap buttons for maximum ease of use. Granted, many people may want to turn pages by tapping the screen, especially if the volume controls are in the wrong position. But many if not most phones have them handily located. I won’t buy the argument that Google or any other OS provider restricts the use of volume controls. Amazon lets you use volume controls as page-turners in its Kindle Android app. If OverDrive encounters resistance, then it should speak up. To address an obvious question, a Libby setup option could allow users to decide if they wanted to use the volume controls for the original purpose or for page turning. Yes, the app also plays audiobooks. But many people will still prefer those button for page turning of ebooks. So far OverDrive apps can do digital audiobooks but no text to speech, which would be useful when an audiobook wasn’t available. Sooner or later I’ll address this issue in another post. With so many people pressed for time and suffering long commutes, TTS would be a natural. While OverDrive’s sister company, Rakuten Kobo, is now in audiobooks, machine-created speech isn’t the same as the natural variety—so we’re probably not talking about the hugest revenue loss. If we are, then questions arise as to whether OverDrive is letting its commercial needs come ahead of library patrons. As I see it, fair use should allow TTS. But as a compromise, perhaps adjustments in payments from libraries could be made. I’m all in favor of the money being available as long as libraries aren’t overcharged. As it happens, all the public libraries in the U.S. are spending only around $1.3 billion a year for all content, paper and electronic—a major reason for a national library endowment, which could use OverDrive and other existing companies as contractors even though librarians and people reporting to them would be running the show. Update, 5:20 p.m. EST, Dec. 6, 2018: I’ve added the suggestions that readers also consider reaching out to Amazon directly. Update: 9:30 p.m. EST, Dec. 6, 2018: Results of the app compatibility test for the Amazon app store suggest that commercial considerations—not technical obstacles—are almost surely why Libby is missing from the store (for Fire owners). So I’ve modified this post to reflect that. Previous Previous post: 2018 iPad Pro for readers and writers: Mixed feelings. High time for mouse! When I get to talk to libby representatives I generally ask questions like the following. When is Amazon fire going to work with libby? When will the wish list feature work since tags are device specific? Are we going to ever recommend purchases for libby like we can overdrive? (Seriously I’d like to quit having both on my phone.) I also mention any concerns I hear at work. I’ve had a chance to ask questions once a year so far. All excellent points. I think it made sense for Overdrive to team up with Amazon to do direct delivery through Amazon’s lending system. Amazon’s lending feature is fully developed and works smoothly from the Overdrive site. Now though Libby’s interface and platform is much more user-friendly (I’ll grant that), but what use-cases and functionality make it necessary for library systems to embrace Libby over lending-through Kindle? It should not matter to Amazon whether Libby or Google Play books can be downloaded onto the Fire. It strikes me as short-sighted; it makes Kindle a crippled device when compared to an android. With my android, I can read ebooks on GPB, Kindle app, Libby and several other reading systems. I doubt that Amazon would allow this app on their appstore. None of the other ebook reader apps are on it, including the open-source ones like FBReader. It does run fine on an unmodified Fire if sideloaded and I’d expect that others would also. It’s still running Android underneath Amazon’s UI. Amazon just doesn’t want to make it easier to run the competition’s apps on their devices, even if they don’t lock them down very hard. @Thomas: Thanks for your take on thus. Given Libby’s importance to the library world, Amazon needs to change its mind. The OverDrive app is in the store. So are some other reading apps, including library ones.